In addition to seasonal Christmas lights, Simply Lit also provides landscape lighting installation and landscape light maintenance services to customers throughout the Atlanta metropolitan area. Simply Lit prides itself as a professional and artistic installation company. 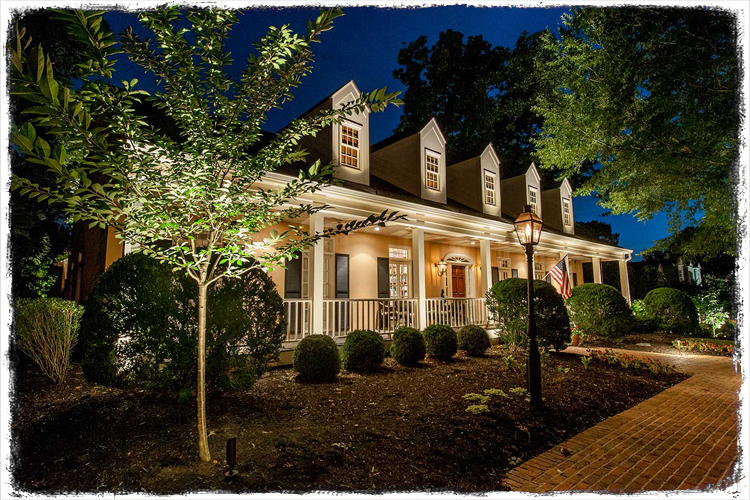 Each home and yard is unique and requires a special lighting plan. Our designers will tour your property before creating a design with strategically placed lighting fixtures with consideration to color temperatures, beam angles, and luminosity. Most landscape lighting installers use only two types of fixtures, one bulb option. A precisely planned display ensures your home will look beautiful at night. Not only is the design of the outdoor lighting system important, but the quality of installation is equally important. These outdoor lights are meant to last for years to come. To ensure a long-lasting quality system, solid brass fixtures must be used, wires must be adequately buried and protected, and the system must be maintained. When doing service work, we always stumble upon broken fixtures, exposed wires, and poorly placed lights. Speak with one of our landscape lighting associates to begin the process of creating a design that will accentuate your home. After a design has been finalized, we will begin the installation process. The install is usually is completed within the day. We'll install all the fixtures, point them, then bury the wires. As landscape lights are subjected to damage from the elements, including landscapers, we offer a maintenance program for our customers. If you're not a customer of ours yet, we can still service and fix your existing display. Upgrade all bulbs to LED. Replace any burned out bulbs. Clean all fixtures and lenses. Check voltage and re-wire if needed. All landscape light systems should be maintained annually. Simply Lit™ is registered trademark of Atlanta Loves Christmas Lights, LLC.